First, deliver on their current work. Teams do not build fake applications; they focus on their real-world product work, deliver against their backlog, and add value to their customer. Second, learn how to acquire and develop long-standing skills. Learning is essential to the Target culture and to keeping up with the ever-changing world of technology. Teams must be willing to commit to learning and accept that they may need to slow down to accelerate that learning. These two goals are essential to come into the Dojo; continue to deliver value while learning something new or improving a current skill. No doubt you’ve heard it in the news. Retail is transforming faster than ever, online growth is exploding, and mobile apps are changing quicker than you can say Pokémon Go. In order to stay competitive Target had to change how we work and deliver value to our customers. Like all large companies that grew up in the industrial age, we were relying on old methods like capital planning and waterfall management to run our business. If we wanted to survive and thrive we had to embrace a new mindset and build a new culture. How do you change the mindset and culture of an entire organization with thousands of employees? You can’t just conduct trainings and run through a few computer-based, learning modules. With over 400 teams to transform and generations of culture to unlearn, we had to change our approach and we had to go big. Learn more about our journey. Enter the Dojo… "The place of the way"
Based on the Japanese places of learning, the Target Dojo was built as an environment where teams can enter an immersive learning experience focusing on Product, Lean, Agile, and DevOps mindset. Gone are the cubes that isolate. 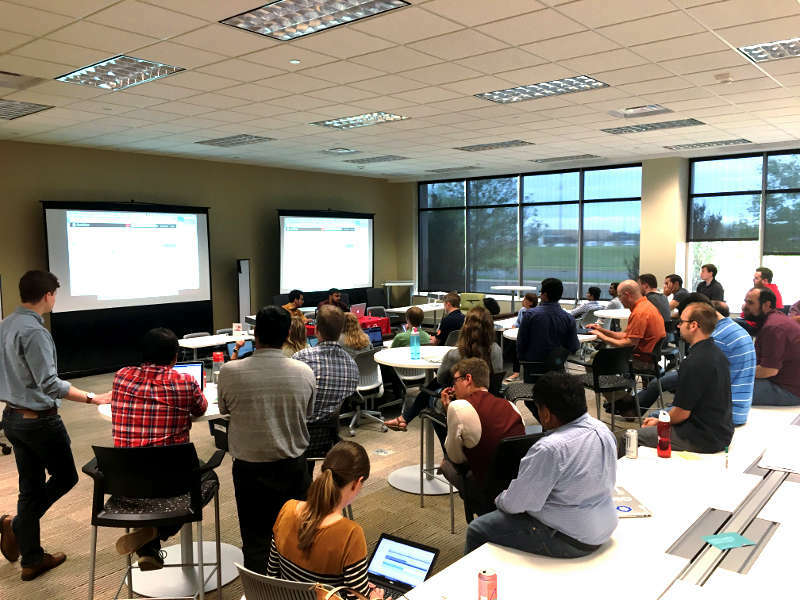 Instead teams sit around large tables surrounded by white boards and large TV monitors that encourage sharing, discussions, even arguments, but always with a focus on collaboration and growing. The space is also specifically designed to get people out of their old environment and break their old patterns. More than space, the Dojo is about access to people with a variety of skills. The Dojo is staffed with a team of Agile/Product and Technical coaches to help teams truly learn and use the skills and values they need to succeed. 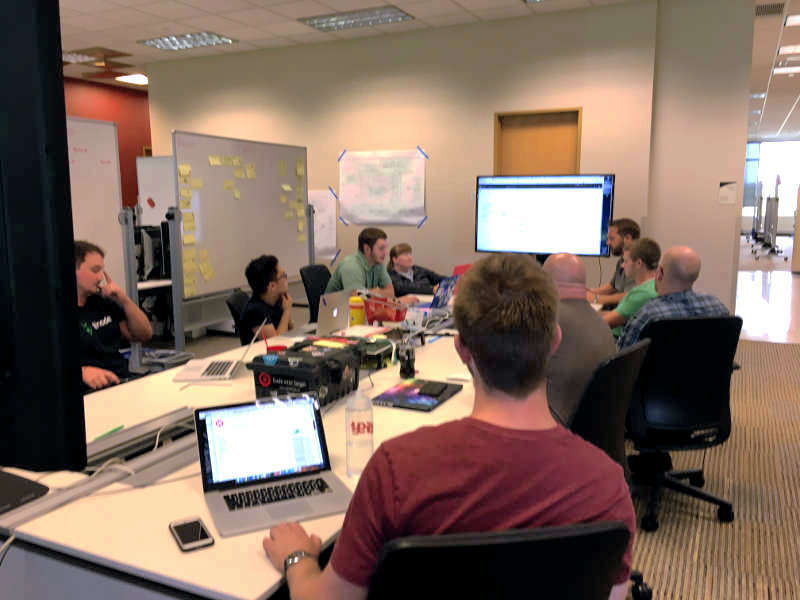 When each team enters the Dojo, they are assigned coaches to help them learn Product, Lean, Agile, and DevOps mindsets and practices, including self-organization, prioritization, outcomes based goals and more. Coaches sit side-by-side with teams to help them learn the new skills and technologies needed to build and run their product. Whether it’s product definition, product discovery, story writing, value stream mapping, continuous integration, continuous delivery, automated testing, cloud, or a variety of other topics, the coaches tailor the experience to help the team get up to speed many times faster than they could on their own. The Dojo is truly a fully immersive experience to show how all these pieces work together to create a new way of delivering a product. Yes, the learning curve is steep, but teams emerge from the Dojo with stronger skills and a new confidence to sustain the momentum going forward. A team may not be able to learn everything they need in one experience, therefore teams may have several experiences in the Dojo, learning and delivering something new each time. The most popular offering in the Dojo is the Dojo challenge. A team enters the Dojo for about 6 weeks with a real-world goal (like creating a new app). However, completing the goal is secondary to the challenge. The primary goal is to help the team learn some new skills, rooted in the mindsets that are important to Target. The drive to learn in a hyper-paced environment is the key. Where a typical sprint is 1 - 2 weeks, in the Dojo, they are 2 days. This intense pace helps teams quickly organize, break down the work, realize success and build muscle memory so they can take their new skills with them when the challenge is over. We’ve made great progress so far, but there is more to do. Since the Dojo started, we have added new services such as including non-technology teams, product trainings & workshops , flexible formats to Challenges, and even a new support form called “Yellow Brick Road” to helps teams identify exactly what they need to learn as well as to start leveraging other teams like security, cloud platform, and architecture. It takes courage and risk to admit what has worked in the past will not work in the future, but we are always driving to learn, to grow, and to change. Jeremy will be on the panel to answer questions about Target's immersive learning environment, The Dojo. Come hear about what the Dojo is, what the Dojo offers to Agile teams and the organization, and the benefits that come from an immersive learning environment. Find yourself among 1,000+ Scrum and Agile practitioners from across the globe who “come to-gather” for new ideas, community collaboration, and an opportunity to create essential connections. Ross and Travis share Target's continued adoption of Test Driven Development (TDD).